India is most popular for tours and travel activities to discover the Delhi to Goa, Golden Triangle, Delhi to Sikkim, Darjeeling and Ladakh. India, officially Known as Republic of India' (in Hindi known as Bharat or Hindustan), is the seventh largest and second most populous country in the world. India is vast and has a huge population of 1 billion. At times it can feel as if the whole population is in the same place at the same time as you! You will become fascinated with India, its cultures, its people, and the continuous stream of activity going on around you. India is bordered on the north by Pakistan, China, Nepal, and Bhutan; on the east by Bangladesh, Myanmar (formerly known as Burma), and the Bay of Bengal; on the south by the Palk Strait and the Gulf of Mannar (which separates it from India) and the Indian Ocean; and on the west by the Arabian Sea and Pakistan. At one point, 'Lands End' at Kanyakumari, three seas meet - the Indian Ocean, the Arabian Sea and the Bay of Bengal. 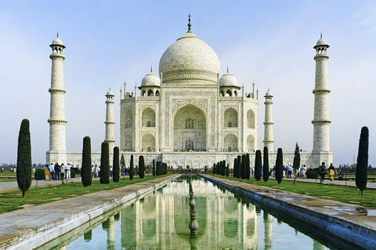 The sights, sounds, and scenery of India are unique and amazing with grandiose temples, lush paddy fields and stunning beaches. In the north, Shrub-land and desert create a sublime backdrop and a visit to the 'Golden Triangle' (Delhi/Agra/Jaipur/Delhi) will take your breathe away. It is divided into 26 states and 6 union territories, and has 17 major languages with 844 dialects, making this country and its people culturally diverse. Religion plays an important role in the life of the country, and is one of the few countries in the world which have such an ancient and diverse culture. Their arts and crafts are world renowned with sport being one of their favorite past times, and cricket still acting as one of the most popular activities.